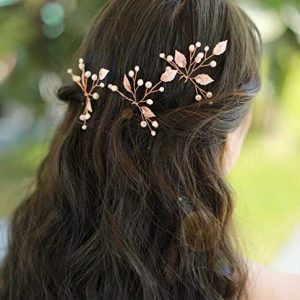 Best Hair Jewelry Trends and Inspiration For Fall 2018! We can’t really call it a new trend, because it is centuries old, but hair jewelry is definitely in fashion this season. Whether you let your tresses fall free or you put each strand up in a tight ballerina bun or a fancy French knot, even Hollywood agrees with us that hair jewelry can be the missing addition to your look. From small, bejeweled pins to large, ornate crowns, adding some bling or a simple shiny bit of gold or silver is always a good choice. Hair jewelry has been historically worn by everyone from the first humans to walk upright to modern day royalty. It is found in every culture and on nearly every continent throughout history. A piece of hair jewelry can be the thing that takes your look for “Nice!” to “Niiiice!” And once you get past the fear of “How do I even wear that thing?” you’ll find hair jewelry simple to add to your look and it will constantly draw new compliments. Bejeweled hair pins, often seen on brides and even more often seen on red carpets, can be found in a myriad of shapes, sizes and designs. 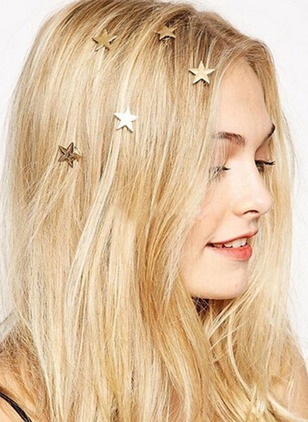 From small starfish to large floral bouquets, there are hair pins to complete any look. Going from the office to a date? Or from a kid’s birthday party to an evening out with the girls? Slip a few quick pins into that updo and you’ve just transformed your look. Hair jewelry can be a few small barrettes or an elaborate twisted metal headband showered in rhinestones. But the best part about hair jewelry is that it is super easy to find multiple options at affordable prices. Hair jewelry can make the outfit as the finishing touch, or it can be the centerpiece the rest of your wardrobe revolves around. But either way it is always in season and always affordable and should definitely be a part of your beauty process. 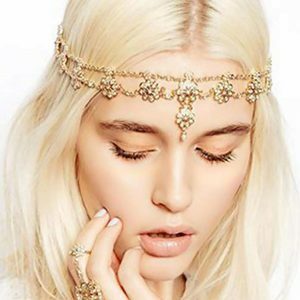 Pieces like hair sticks or head chains can be a bit baffling as you figure out how to wear them, if you should wear them, or how to make them stay in place once you’ve decided to wear them. But with a little experimentation and the right piece of hair jewelry, that look you’ve always been afraid to try can be attainable. Don’t be afraid to mess it up, mix it up, and give it a chance. And if you’re really stuck, we have some style tips below and there are endless amounts of online tutorials to help you figure out how to wear that piece of hair jewelry you’ve had your eye on. Some larger or looser pieces, like head chains, may require the addition of a few bobby pins to keep it in place, but if you give it a few tries you’re bound to figure out how to make that piece work. When Emma Watson showed up to the L.A. premiere of her movie she broke all fashion rules by ditching the dresses and gowns and instead donning a tight black jumpsuit. But, in a nod to the fairy tale character she had played in the movie, she wore a few subtle pieces of hair jewelry that completely changed the fashion game. Delicate little twists of metal adorned either side of her updo, proving hair jewelry isn’t just for wedding dresses and ball gowns, and it can be empowering and beautiful on any woman. Those few bits of gold shimmering through her locks were the perfect addition to her red carpet trouser look, and they can have the same impact on your look. Nearly every long-haired celebrity is finding a reason to add hair jewelry to their look this season, and now is a great time for you to join them, as hair jewelry is inexpensive and can be found in any number of colors and styles. Beyond its beauty and fun, hair jewelry has a long and fascinating history that only makes us love it even more. From the macabre Victorians who literally made hair jewelry out of their loved ones’ hair in honor of them (ew! And don’t worry, we aren’t going to suggest you try that!) to the endless number of pieces worn in royal weddings and adorning the heads of royal infants, hair jewelry has served multiple purposes along every culture and country in the world, and today it is still just as versatile and full of variety. Hair jewelry has literally been around for as long as humans have been aware that they had hair. Simple hair combs have been found that date back to the Stone Age! Over the centuries and millennia of hair jewelry humans have created so much variety that it is hard to pin down the most popular pieces or to even figure out where it all began. The history of hair jewelry has a lot to say about the way we have treated our tresses and the way we think about our locks. If there’s one thing to learn it is that the possibilities are endless, and with hair jewelry there is always time to be creative! We have collected ten favorite pieces of hair jewelry here to get you started on this fascinating trend. There are so many amazing things that you can do with your hair and just a little bit of added bling, but if you’re looking for a lot of bling we found that for you, as well. Add these to your accessories drawer and you’ll be well on your way as a hair jewelry aficionado! Our Choice of Hair Jewelry Pieces for Fall 2018! There’s something so fairy-esque about metal imitating nature, isn’t there? Something as simple as a small silver tree branch or a gold metal leaf can make you feel like Titania sitting in an enchanted forest surrounding by magic and fairies that feed you grapes. And this set of three pins does not disappoint. The rose gold takes the harsh yellow of gold and softens it with a slight blush of pink. These would be the perfect accent for a bride, but could also give that fairy look for prom or a night out. The best thing about rose gold is it stands out in dark hair and sits in beautiful accent to lighter colored hair. These Rose Gold hair pins come in a set of three. Clustered together they create a bouquet in your hair, or you can separate them to bring sparkle all around your face. 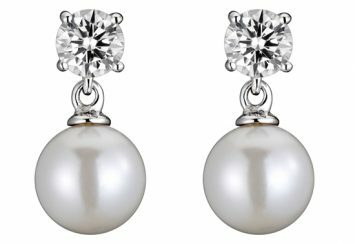 The gemstones and pearls side-by-side create an elegance that can’t be beaten. We think these three clips are the perfect look for your upcoming big day! 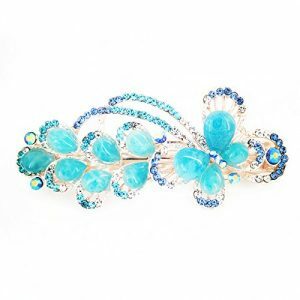 This rhinestone and alloy hair clip comes in five different colors and we love the way it walks an interesting line between playful and sophisticated. Equally fitting on the red carpet or at that fancy restaurant for your friend’s birthday bash, the butterfly design lends an air of fun while the overall composition still allows this piece a sense of maturity. This would also be a great first piece of fancy hair jewelry for a young girl’s birthday party! Perhaps your niece needs some bling. Choose from the blue, red, pink, brown or a super fun multicolor piece. With a collection of all five, you can match this sparkly bit to any outfit, but it also has an option that will look beautiful in any hair color! At 3.5 inches by 1.5 inches this clip can settle into longer hair snuggly. This unique hair clip could totally change the way you get dressed in the morning. (Or, better yet, the way you dress for the evening!) Flirtatious and fun, this is a great way to add some fun and flair to your hair jewelry colleciton. 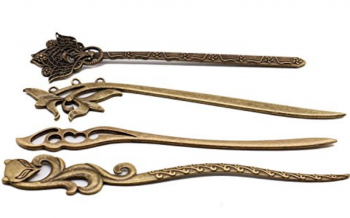 If you’re going for a different look for longer tresses, this set of four vintage chopsticks is sure to have something for whatever look you’re going for. Matched with a cardigan and jeans, these could easily be worn by a sophisticated librarian. Switch to a little black dress and a more intricate hair stick to upgrade your look for the evening. There are four designs, ranging from intricate and fancy to simple and minimalist, offering countless options. These hair sticks measure in at just under six inches long and can easily slip into your purse on the way out the door as a backup hair piece. Hair sticks work in medium or thick hair, and are extremely versatile. Hair Sticks can be a bit tricky to put in the first time you use them, but luckily there are endless ways to wear them, and just as many online tutorials to teach you how! There are hairstyles that use one stick, and others that use two. 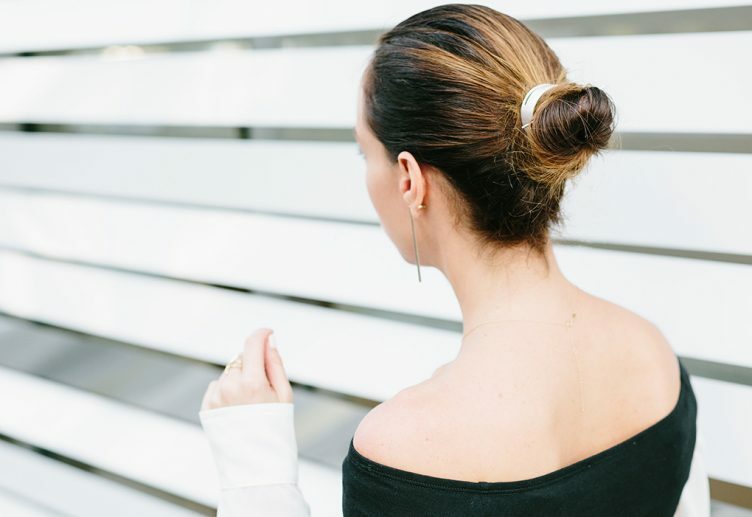 One of the easiest ways is to spin your hair into a tight bun, tucks the end in under the bun, and slip the hair pin through your bun against your head to hold it into place. This will hold your hair up out of your way, but allow for a quick and easy way to take it down if you change your mind (or if that one guy from accounting steps up to your desk.) Keep these hair sticks on hand for making quick changes to your look any day. 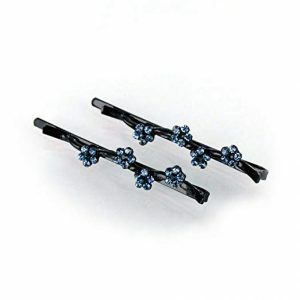 For a fun, summer festival kind of look we love these sweet little bobby pins adorned in petite blue crystal flowers. These precious pins are just right to add a little extra punch to a simple ponytail, or keep your hair out of your eyes at that family dinner. We particularly like the way that the blue stands out against the black of the bobby pins and the way these two colors together could accent nearly any hair color. The best part about this fun take on the ever-classic bobby pin is the variety of hair style options. These two pins could be the finishing touch on that fancy updo, or the last minute afterthought when you’re late for class and realize you forgot to do your hair at all. Simple and timeless, bobby pins always have a place in making your look fun and fresh. And with the added bonus of fun little blue flowers, these bobby pins can do that and give you a little flash of color. 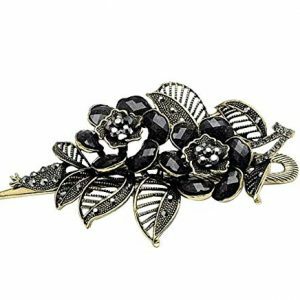 In the age of television reboot nostalgia and so much fashion returning from the past, vintage is always in style, and this little black alloy and rhinestone vintage alligator clip is no exception. Shimmering and shining, this piece could be just what is missing from your vintage look for that next office party or a big date. At four and a half inches long, this is a larger clip and is sure to demand attention. Don’t be afraid to experiment with something so lovely. There is always time to learn a new hairstyle that will go well with a piece like this, too! Gather all of your curls at the nape of your neck with this flowered clip, creating a bouquet look. Or lift half of your straight hair up out of your eyes and into this clip higher on the back of your head. Perhaps a couple of small braids meet at this small bouquet. No matter how you wear it, this piece is going to grab attention and allow you to shine! This whimsical rhinestone peacock hair clip makes us think of the fun of a royal masquerade ball, and who doesn’t want to be in a fancy ball gown with shimmering jewels in their hair? The multicolored crystals perfectly match the silver-colored alloy metal but our favorite feature is those comb teeth. Ladies, those comb teeth on this beautiful peacock are textured so they won’t fall out! That’s right, textured comb teeth. This beautiful spiraling texture gives this comb the added grip that prevents many people, especially with straight hair, from using similar hair combs. Our fun peacock friend would be beautiful nestled into a bed of curls, or holding a sweep of locks on the side of your face. 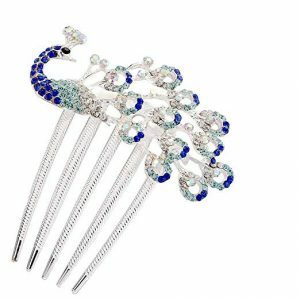 Not only do we think you would love this peacock hair comb, but wouldn’t this make a great gift for your friend’s bridal shower or that next big birthday bash? It is feminine and delicate, yet strong and substantial, so it can fill so many purposes. No matter what it is for, this peacock will definitely give you the standout look you have been seeking! This set of three hair clips is going to take us a bit of a different direction. 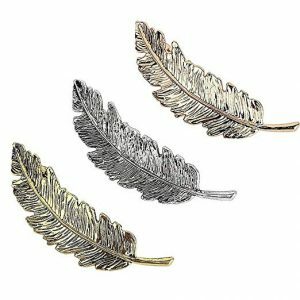 These little feather clips are for that look that doesn’t need added bling, but instead needs a little bit of practicality. This set of three clips, one in gold, one silver and one in a rose gold color, offers up a variety of options for every day wear. We particularly like these feather hair clips for their size. These are fantastic for thicker hair. At about four inches long, they could hold all of your hair back if needed, or just a little for a more relaxed look. Great for the office, or to keep your hair back while baking with the kids, these clips don’t sacrifice beauty, but still provide realistic use. Sometimes hair jewelry is just for fun, sometimes it is efficient. 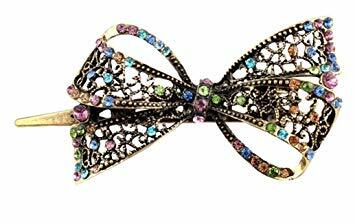 Have a look at this totally adorable Crystal Bowknot Hair Clip! This hair clip is a great size. This item is ten centimeters (four inches) long, so it will span across the back of the head, really highlighting any type of braid, weave, roll, tie or ponytail. The bright colors are whimsical, but also stylish allowing this accessory to be worn by any age and for a multitude of events. You can play this up, with a cutesy child-like style, dress it up with formal wear, or play it down with the most casual t-shirt and jeans night out with friends that you can imagine. This item calls the attention of others – perhaps even that one special other person. The human mind is hardwired to be attracted to light, which means that when you wear something that reflects light, people literally cannot help but look. We have all heard that first impressions are the most important, but to make a good first impression, you need to attract the senses of others. In order to draw them to you, in order to create that opportunity, you need a nice perfume, a dash of charisma and of course, something magnificent to draw the eyes. It sparkles. It shines. The colors force the human eye to playfully dance around the piece as light strikes them. Remember how much we loved when metal imitates nature? 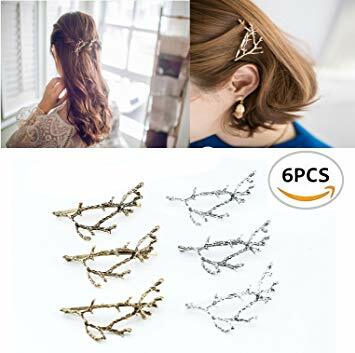 These tree branch shaped hair clips are just the perfect elegant touch to a wide variety of styles. The versatility of this piece is far reaching. It can be used for a formal, semi-formal, or even casual event, whether it be cosplay, prom, a wedding, a sweet sixteen party, quinceanera, bat mitzvah or even just your first date. Sometimes the key to beauty with any nature inspired product is to create a fine balance between simplicity and an ethereal mimicry. This piece mirrors a sample of twigs snapped from the branch, that has been dipped in either silver or gold. It can be used in fancier hair styles by adding more than one piece or even by other pieces such as silver leaves, feathers and flowers, or it can be kept as a simple accent. In cosplay, this can be used for a character from pixies and faeries, to magic users, tree sprites and even gnomes. We’re going to finish this list with the piece of hair jewelry that is probably the most baffling, the head chain. How do you keep it still? How does it stay on? Everyone deserves to wear something as beautiful as this rhinestone head chain, so we’re here to give you a few tips so that you can go out and make a statement. If you want something a bit more unique, and a lot more gypsy, this rhinestone head chain is definitely the answer. Simple and stylish, it lays over your hair and settles in the center of your forehead for a totally new look. Great for that music festival or trip to an arts festival, this piece demands attention. The delicate floral pattern is reminiscent of the flower child of days past, while the simplicity keeps it modern. This piece is timeless and will always be in style. This particular head chain is really great for someone who hasn’t worn one before because it has a stretchy band. That’s right, a stretchy band sits along the very back so that this piece can fit any head from 21 to 24 inches in diameter. With corrosive-resistant metal, and precise craftsmanship this bold head chain will make a beautiful statement when you wear it out and about. If you are worried about slippage, though, a couple of bobby pins can easily pin that elastic band in place, allowing you to move freely and confidently. The best thing about a head chain like this, though, is what you can accompany it with. Pair it with a similar style bracelet, anklet or ring to give yourself that truly cohesive head-to-toe look. This sort of piece offers up something truly different for your look. 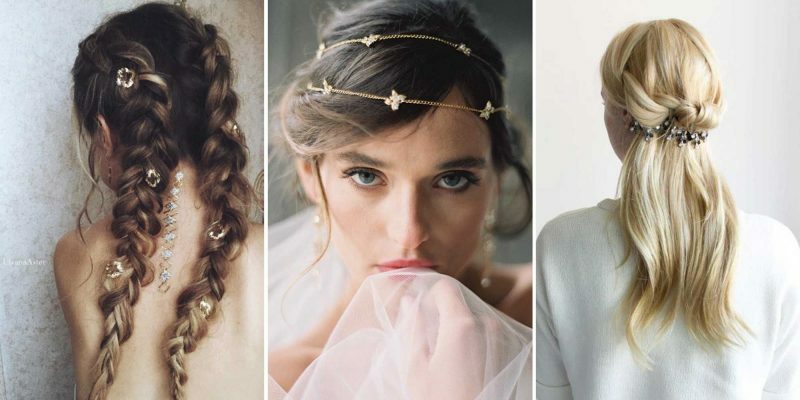 Those are our ten favorite pieces of hair jewelry right now, but there’s a guarantee we could have easily added ten more beautiful pieces to this list! There are so many amazing kinds of hair jewelry to play with. Hair jewelry is fun, versatile, and the possibilities are endless. There are also many kinds of hair jewelry we didn’t even get to, like hair beads and ribbons, so keep exploring this amazing fashion trend. There’s much more to see. ~ Bling is fun, but sometimes a subtle look is good. Stock your collection with variety so you have jewelry for work and for play. ~ That delicate floral piece you’ve fallen in love with isn’t just for weddings. Slip that clip into your hair whenever you feel like you need the added bonus of a spring bouquet. ~ Dry your hair completely before putting in your favorite piece of hair jewelry. 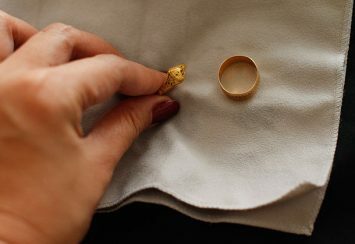 This serves two purposes: it protects your jewelry from rusting and it prevents your hair from wiggling loose from the look as it dries. Hair jewelry is as old as the human race, and it never goes out of style. Find your way to a new look today by experimenting with a new piece of hair jewelry!